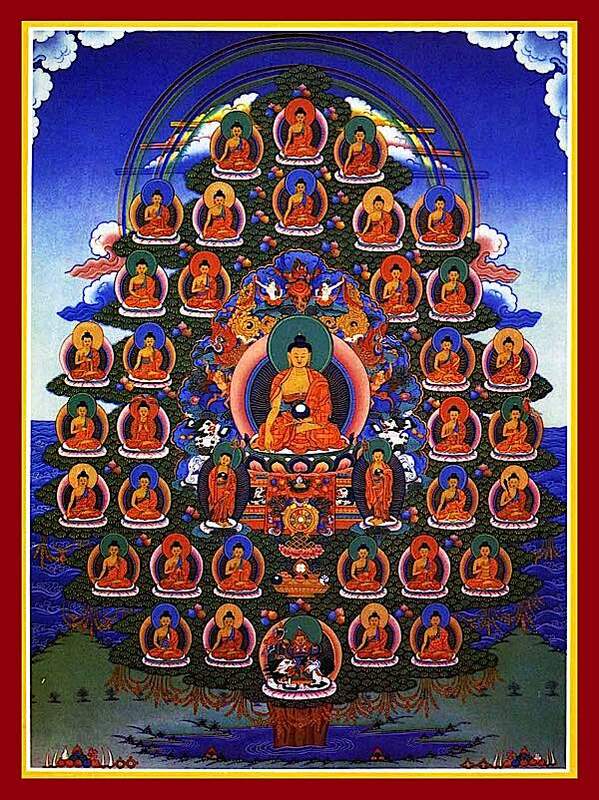 The 35 Buddhas including Shakyamuni visualized as a merit tree. Even the most senior of Lamas still practice the Thirty-Five Buddhas regularly. The great Lama Tsongkhapa practised and taught 35 Confessional Buddhas all of his life, and famously performed 3.5 million prostrations — 100,000 to each of the 35 Buddhas — so many, that his body left an imprint on the retreat cave floor. “The power of regret for having done the destructive action. 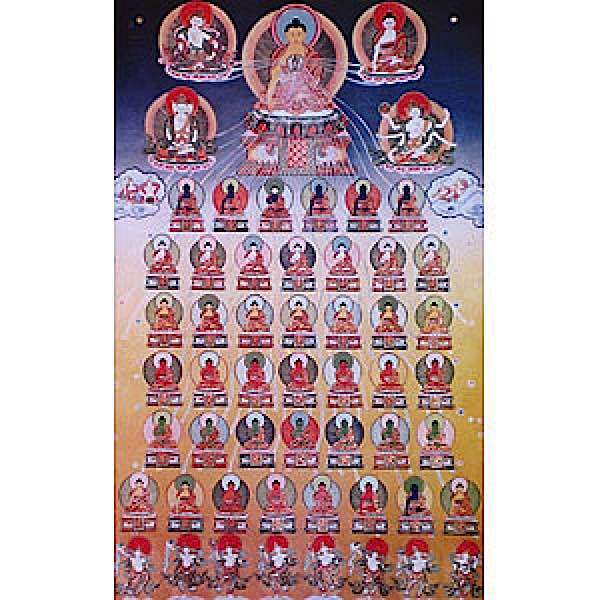 A beautiful traditionally framed thangka of the 35 Confessional Buddhas. 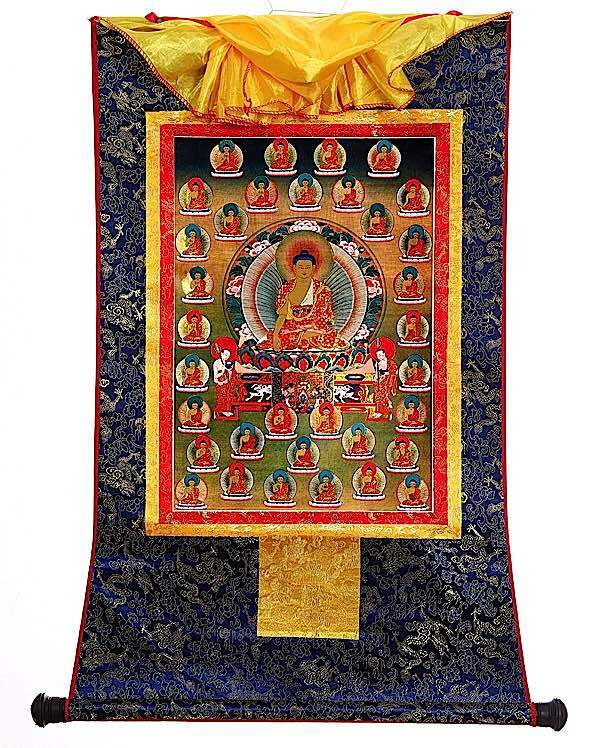 If it is difficult to visualize, it can be helpful to do the practice in front of a thangka such as this. You can also source many inexpensive poster print outs. Karma is a universal truth, not only in spiritual practice but in the physical world (i.e. Newton’s Law). Some people try to dismiss Karma as symbolic or even imaginary. Even if it is imaginary, it leaves an indelible footprint in our lives. For example, unless we have no conscience (i.e., a sociopath), the guilt we feel over a negative action, such as killing an animal (even by accident), creates many stress-factors that influences everything in our lives. Thoughts of the animal’s suffering arise, causing guilt to imprint. We can’t get the image out of our head. We see the animal breathing it’s last gasp, eyes pleading in pain. 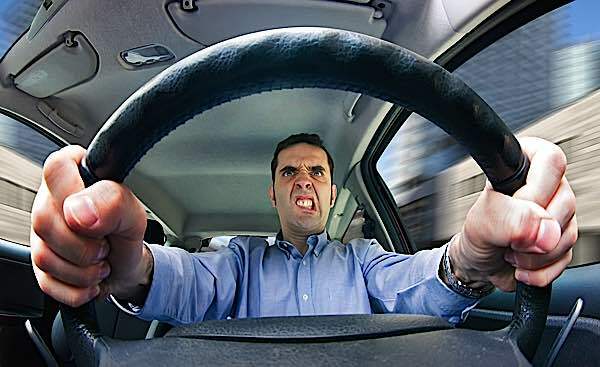 Road rage and other daily incidents create negative Karma in our mindstreams. It’s not that it’s a supernatural force waiting to zap us. Our own minds take the imprint — the underlying subconscious guilt we have for giving the bird to a person who just cut us off — and over time the stress builds. Practices such as 35 Confessional Buddhas help release the pressure. When we try to meditate weeks after this negative imprint, those afflictive thoughts arise. We can’t unwrite that from the hard drive of our brains — not without special security software (in this metaphor, the software being 35 Buddhas.) As Buddha taught — and many mental health professionals would concur — these guilt feelings imprint on our conscious and subconscious long after the event. In psychiatry, the Doctor might try to pull out the feelings of guilt and have us confront them. In the Catholic faith, we might do “confession” to a priest, with much the same effect. In Mahayana, we practice purifications, always involving the “Four Opponent Powers.” Whether this is just us confronting our own thoughts, or confessing it to a Buddha, it amounts to the same thing. It is the actions of Body, Speech and Mind, carefully formulated in this Sutra practice of the 35 Confessional Buddhas, that helps us release our guilt and other obscurations. On the other hand, if we ignore it, bury it, try to forget, the seeds of that negative Karma arise unexpectedly years later. In Buddhism, we are taught that karma that is not purified multiplies. This, too, is sound psychology. The guilt we try to bury tends to become a behavioural or stress issue in the future if we don’t confront the pain and make peace with it. 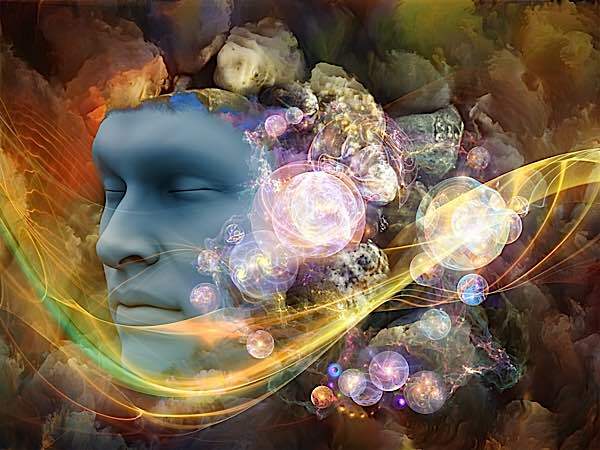 Karma imprints on our mind stream. For our own physical — and spiritual — health, these negativities should be purified through the Four Opponent Powers. The Bodhipattidesanavrtti, translated as The Bodhisattva’s Confession of Ethical Downfalls, is a powerful practice found in the Ratnakutasutra — The Stack of Jewels Sutra (sometimes translated as Jewel Heap Sutra). The Maharatnakuta Sutra, as it’s also titled, is a collection of 49 Sutra texts, including the Triskandhadharmasutra (Three Heaps Sutra), wherein the 35 Buddha’s practice is found. Originally, Shakyamuni Buddha taught the practice to help 35 of his students who felt remorse over the death of a brewer’s son. 35 Confessional Buddhas with Shakyamuni Buddha at the centre. It is often the first practice given to a serious student. Through this practice — and especially the conscious practice of the Four Opponent Powers — the student’s mindstream is purified. Then, no matter how advanced we grow in our practice, the 35 Confession Buddhas’ practice is likely to remain a regular meditation throughout our lives. Why? Because, as long as we are humans, we create negative karma and obstacles each and every day. This is the reason that even senior Lamas continue the practice. 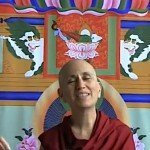 If we consider the labours of Milarepa to burn off his negative karma — endlessly hauling rocks to build houses for Marpa — allocating 20 minutes a day for this practice seems pretty fortunate, considering we develop similar merit. Of course, Milarepa was burning off the karma of multiple homicides. 35 Confessional Buddha’s works in a similar fashion to Catholic confession. We confess our “sin”, the priest gives us a task to help us “purify” our souls, and at the end, he blesses us and tells us to sin no more — thus, we are restored to Grace. 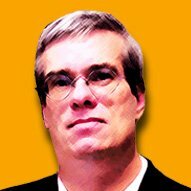 All four opponent powers are there in Catholic confession: Confession (Regret), assigning a task, such as a certain number of Hail Marys (Repair), asking “Are you sorry for your sin? and do you promise to refrain?” (Resolution), and “Go and sin no more” (Remedial action.) Psychiatry employs a more elaborate version of this process. Of course, Buddhism predates both, with the Four Opponent Powers practice of 35 Confessional Buddhas. The key difference is that the Buddhist method is “self-help.” No outside party is forgiving us. The other key differences are conceptual. Instead of a soul, Buddhists have “mindstream”; instead of sin, Buddhists have “afflictive obstacles”; instead of forgiveness from an outside agent, Buddhists pro-actively resolve to undertake logical remedial action. Many people prefer to chant and contemplate the sacred Sanskrit. Others prefer the deep resonant chanting of Tibetan. Still, others, prefer English chanting. However, for some people, the English translation sounds too descriptive and loses some of its profundity — the sound of sacred chanting. All are correct, all have merit, and it’s a matter of preference. [See the video below to see the difference when chanted in English. There are benefits simply from pure recitation only (speech only) and added benefits if combined with prostrations (body), and extraordinary benefits if combined with visualization. Even if you are doing recitation only (for example, while you are walking, or silently on an aeroplane), you should still be mindful of the Four Opponent Powers. You must think of the things you have done that you regret, and then meditate on each of the Powers. If you are doing the full recitation, it will include the words of regret, reliance, resolution and remedy. If you are able to do a full practice, include the visualizations and physical prostrations if possible. For visualization, you imagine the entire merit field of the 35 Buddhas are in front of you [Refer to the thangkas in this feature.] It is important to also try to visualize that white purifying light is coming from the hearts of all the Buddhas and entering your body through the crown of your head, purifying you of all negative Karmas. Imagine your body suffused in white, purifying light. 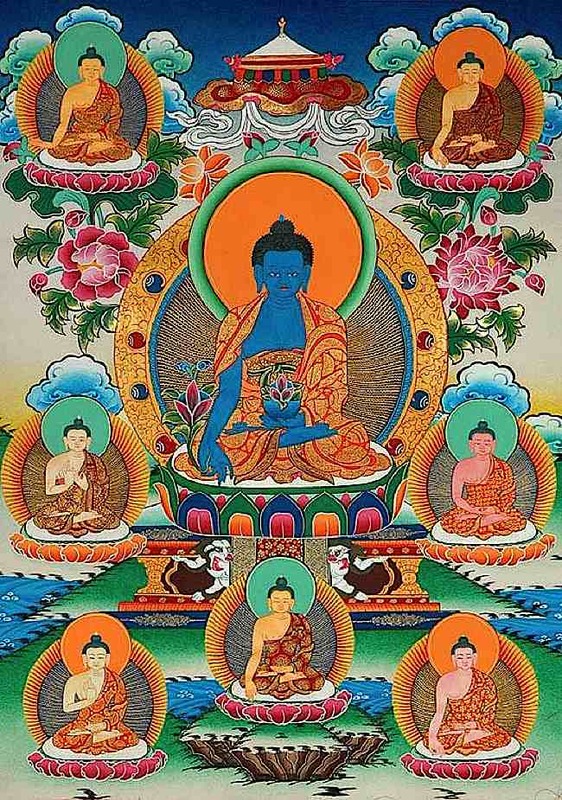 One of many thangka versions of the 35 Buddha’s visualization, this one including the Medicine Buddhas. Taking Refuge is what really makes the practice a Buddhist practice. It is in refuge we find “Repair” and “Resolution.” It is our Refuge that protects us from the effects of negative Karma. Until you have this memorized, recitation is equally beneficial. Once memorized, however, you can focus on your visualization and prostrations. You can, of course, recite the Sanskrit names, Tibetan names or English names. Most teachers agree they are all as valid. For many practitioners, though, the sacred sound and rhythm and tonality of Sanskrit makes it worth the effort to memorize the Sanskrit. The Eight Medicine Buddhas. In the centre is Bhaisajyaguru Vaduraprabha, the Lapis Lazuli Medicine Guru, surrounded by the other healing Buddhas. Shakyamuni is the eighth Medicine Buddha. Since Shakyamuni Buddha is already part of the 35 Confessional Buddhas we do not repeat here. 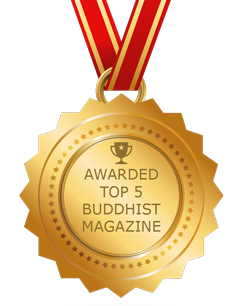 There is great merit in including praise to the seven Medicine Buddhas as well. This is extremely beneficial to practitioners. 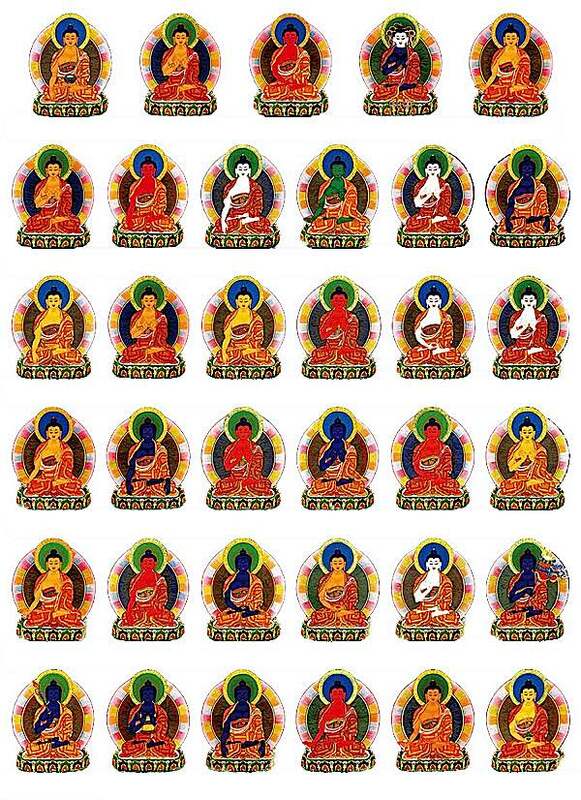 Below, the Medicine Buddha names are added (which makes for a total of forty-two. I, whose name is [YOUR NAME HERE], at all times go for refuge to the Guru, go for refuge to the Buddha, go for refuge to the Dharma, go for refuge to the Sangha. To the Teacher, Blessed One, Tathágata, Foe Destroyer, Completely Perfect Buddha, Glorious Conqueror Shakyamuni I prostrate. To the Tathágata Complete Subduer with the Essence of Vajra I prostrate. To the Tathágata Jewel of Radiant Light I prostrate. To the Tathágata Powerful King of the Nagas I prostrate. To the Tathágata Leader of the Heroes I prostrate. To the Tathágata Glorious Pleasure I prostrate. To the Tathágata Jewel Fire I prostrate. To the Tathágata Jewel Moonlight I prostrate. To the Tathágata Meaningful to Behold I prostrate. To the Tathágata Jewel Moon I prostrate. To the Tathágata Stainless One I prostrate. To the Tathágata Bestower of Glory I prostrate. To the Tathágata Pure One I prostrate. To the Tathágata Transforming with Purity I prostrate. To the Tathágata Water Deity I prostrate. To the Tathágata God of Water Deities I prostrate. To the Tathágata Glorious Excellence I prostrate. To the Tathágata Glorious Sandalwood I prostrate. To the Tathágata Endless Splendor I prostrate. To the Tathágata Glorious Light I prostrate. To the Tathágata Glorious One without Sorrow I prostrate. To the Tathágata Son without Craving I prostrate. To the Tathágata Glorious Flower I prostrate. To the Tathágata Clearly Knowing through Enjoying Pure Radiance I prostrate. 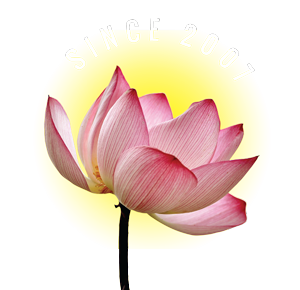 To the Tathágata Clearly Knowing through Enjoying Lotus Radiance I prostrate. To the Tathágata Glorious Wealth I prostrate. To the Tathágata Glorious Mindfulness I prostrate. To the Tathágata Glorious Name of Great Renown I prostrate. To the Tathágata King of the Victory Banner Head of the Powerful Ones I prostrate. To the Tathágata Glorious One Complete Subduer I prostrate. To the Tathágata Great Victor in Battle I prostrate. To the Tathágata Glorious One Complete Subduer Passed Beyond I prostrate. To the Tathágata Glorious Array Illuminating All I prostrate. To the Tathágata Jewel Lotus Great Subduer I prostrate. To the Tathágata Foe Destroyer, Completely Perfect Buddha, King of Mount Neru Seated Firmly on a Jewel and a Lotus I prostrate. 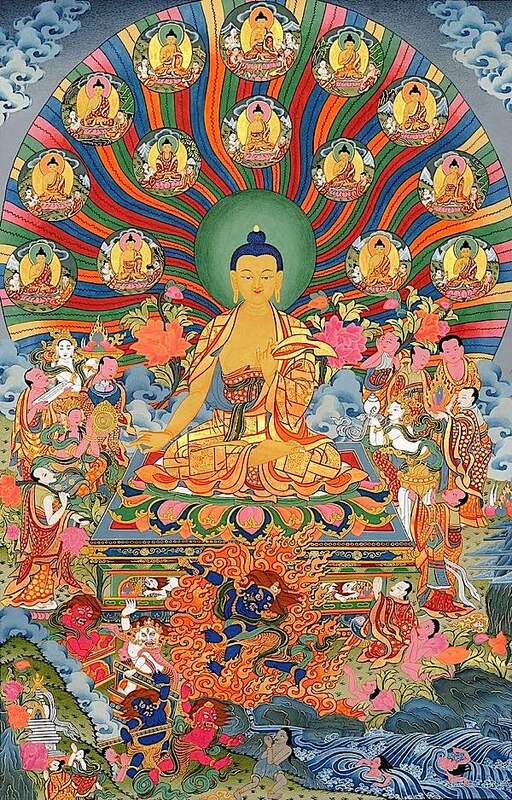 O All you [Tathágatas] and all the others, however many Tathágatas, the Foe Destroyers, the Completely Perfect Buddhas, the Blessed Ones there are dwelling and abiding in all the worldly realms of the ten directions, all you Buddhas, the Blessed Ones, please listen to me. To Bhagavan, Tathagata, arhat, Completely Perfect Buddha, Renowned Glorious King of Excellent Signs, I prostrate. To Bhagavan, Tathagata, arhat, Completely Perfect Buddha, King of Melodious Sound, Brilliant Radiance of Skill, Adorned with Jewels, Moon, and Lotus, I prostrate. To Bhagavan, Tathagata, arhat, Completely Perfect Buddha, Stainless Excellent Gold, Illuminating Jewel Who Accomplishes All Conduct, I prostrate. To Bhagavan, Tathagata, arhat, Completely Perfect Buddha, Glorious Supreme One Free from Sorrow, I prostrate. To Bhagavan, Tathagata, arhat, Completely Perfect Buddha, Melodious Ocean of Proclaimed Dharma, I prostrate. To Bhagavan, Tathagata, arhat, Completely Perfect Buddha, Clearly Knowing by the Play of Supreme Wisdom of an Ocean of Dharma, I prostrate. To Bhagavan, Tathagata, arhat, Completely Perfect Buddha, Medicine Guru, King of Lapis Lazuli Light, I prostrate. In this life and in all my lives since beginning-less time, in all my places of rebirth, while wandering in samsára, I have done negative actions, have ordered them to be done, and have rejoiced in their being done. I have stolen the property of the bases of offering, the property of the Sangha, and the property of the Sanghas of the ten directions, have ordered it to be stolen, and have rejoiced in it being stolen. I have committed the five unbounded heinous actions, have ordered them to be committed, and have rejoiced in their being committed. I have completely engaged in the paths of the ten non-virtuous actions, have ordered others to engage in them, and have rejoiced in their engaging in them. Being obstructed by such karmic obstructions, I shall become a hell being, or I shall be born as an animal, or I shall go to the land of the hungry ghosts, or I shall be born as a barbarian in an irreligious country, or I shall be born as a long-life god, or I shall come to have incomplete senses, or I shall come to hold wrong views, or I shall have no opportunity to please a Buddha. All such karmic obstructions I declare in the presence of the Buddhas, the Blessed Ones, who have become exalted wisdom, who have become eyes, who have become witnesses, who have become valid, who see with their wisdom. I confess without concealing or hiding anything, and from now on I will avoid and refrain from such actions. All you Buddhas, the Blessed Ones, please listen to me. In this life and in all my previous lives since the beginning-less time, in all my places of rebirth while wandering in samsára, whatever root of virtue there is in my giving to others, even in my giving a morsel of food to one born as an animal; whatever root of virtue there is in my maintaining moral discipline; whatever root of virtue there is in my actions conducive to great liberation; whatever root of virtue there is in my acting to fully ripen sentient beings; whatever root of virtue there is in my generating a supreme mind of enlightenment; and whatever root of virtue there is in my unsurpassed exalted wisdom; all of these assembled, gathered, and collected together, by fully dedicating them to the unsurpassed, to that of which there is no higher, to that which is even higher than the high, and to that which surpasses the unsurpassed, I fully dedicate to the unsurpassed, perfect, complete enlightenment. Just as the Buddhas, the Blessed Ones of the past, have dedicated fully, just as the Buddhas, the Blessed Ones who are yet to come, will dedicate fully, and just as the Buddhas, the Blessed Ones who are living now, dedicate fully, so too do I dedicate fully. I confess individually all negative actions. I rejoice in all merit. I beseech and request all the Buddhas. May I attain the holy, supreme, unsurpassed, exalted wisdom. Whoever are the Conquerors, the supreme beings living now, those of the past, and likewise those who are yet to come, with a boundless ocean of praise for all your good qualities, and with my palms pressed together I go close to you for refuge.